Snoring is caused by the vibration of soft tissues in the throat and behind the tongue, this results in the snoring sound you hear. The cause of the sound is as a result of obstructed air movement during breathing. In some cases the sound of snoring may be soft, but in other cases, it can be more loud and unpleasant. Snoring during sleep may be a sign of obstructive sleep apnea (OSA). Long term, snoring can also potentially lead to high blood pressure and heart problems. The good news is that there is a new snoring treatment available and the majority of people suffering from problematic snoring can be effectively treated using a Somnowell appliance. This is an effective treatment for snoring because it tackles the problem at its root cause. 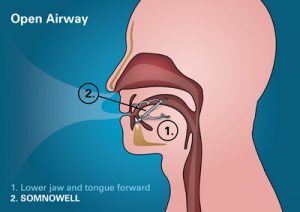 The Somnowell appliance is designed to gently hold the lower jaw and tongue in the ‘recovery position’ while you sleep, keeping the airway open and stopping the resulting vibrations and disrupted sleep. The Somnowell appliance is designed to gently hold the lower jaw and tongue in the ‘recovery position’ while you sleep, keeping the airway open and stopping the resulting vibrations and disrupted sleep. Bruxism is a habit individuals develop related to chewing, it is controlled by the subconscious processes active during sleep. Bruxism is one of the most common types of sleeping disorder you might experience, the sufferer is prone to Grinding teeth in their sleep. This can reduce the amount of rejuvenating deep (REM) sleep obtained. If left untreated, teeth grinding can lead to significant tooth loss and gum recession. The Somnowell treatment for Bruxism is made from chrome cobalt alloy and is impervious to wear from teeth grinding. The smooth polished chrome surfaces of the Somnowell allow the individual to rhythmically move their jaw during sleep without damaging the tooth enamel. The Somnowell provides relief to the jaw joint and facial muscles, and gives the gums and soft tissues a chance to heal and rest.